The Gulf Centre for Human Rights (GCHR) and the Cairo Institute for Human Rights Studies (CIHRS) are deeply concerned that prominent human rights defender Ahmed Mansoor is being subjected to attacks and a media harassment campaign which has been intensified on 17 September 2012, the day in which Ahmed Mansoor participated in a side event entitled “Waging War on Human Rights- Ongoing Crackdown in UAE, Oman, and Saudi Arabia.” The side event has been taken place at the Human Rights Council (HRC) in Geneva and included a recorded speech by Ahmed Mansoor in which he talked about the crackdown on human rights defenders and activists in UAE. On 11 September 2012, prominent human rights defender Ahmed Mansoor was attacked at Ajman University around 4:30pm, as he left the law building on his way to the car park. There is a strong belief that the security apparatus were behind the attack. As a result of the attack, the prominent human rights defender sustained some bruises on his right arm, knees and foot when he fell down on the ground after being roughly pushed by the attacker, who managed to flee with a car in which he jumped holding in his hand the registration plates which were attached to the car softly. Immediately after the attack, a medical report was taken and a case filed at Ajman Police Station (Al-Humaidiah Police Center). 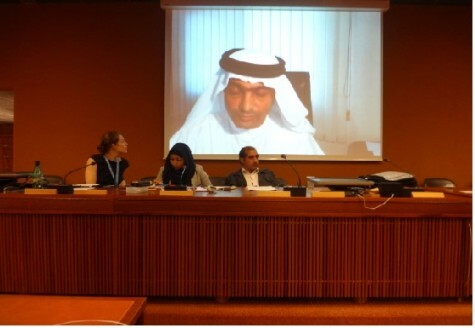 From the early hours on 17 September 2012, the day on which the side event took place at the HRC, the smear campaign against Ahmed Mansoor, using the social media Web Site twitter, Blackberry Messages, and later on the conference which was held on 26 September 2012 about the rule of the international organizations in the Arab spring, has been significantly intensified. The smear campaign never stop until now using Ahmed Mansor’s name, accusing him of participating in a side event financed by Iran. Reliable reports confirmed that the holders of the campaig are well-known agents of the security apparatus in UAE. There is a strong believe that the two attacks and the smear campaign are linked and led by the same source. The allegations against Ahmed Mansoor are crude fabrications. The GCHR and CIHRS, as the main organizers of the side event, are fully independent human rights organizations who solely focus on supporting and protecting human rights defenders in the Gulf region including UAE. We are remain astonished that the two physical attacks and the ongoing smear campaign associated with the malicious and unfounded accusations are leveled at a very respected international human rights figure such as Ahmed Mansoor. The recent allegations of links between the side event and the Iranian Government remain absurd and baseless. Neither GCHR nor CIHRS has any link with the Iranian Government or any of its institutions and such false accusations only seeks to demonstrate the lengths that certain groups in UAE will go to smear those committed to defending the human and civil rights of all the people in UAE. The GCHR and CIHRS are deeply concerned that the repeated attacks and media harassment against prominent human rights defender Ahmed Mansoor are due to his legitimate peaceful activities in defence of human rights in UAE. The GCHR and CIHRS condemn in the strongest term the two attacks on Ahmed Mansoor. We are deeply concerned for his physical and psychological security in UAE. The GCHR and CIHRS also call on the relevant governments, the UN, EU, and leading human rights organizations, to condemn in the strongest terms the attacks and smear campaigns on human rights defenders in the UAE who peacefully exercise their basic rights to freedom of expression, opinion, and assembly.